Buckwheat groats are produces from steamed or not steamed buckwheat by removing the nucleus from the amniotic membrane. Buckwheatgroats take the leading place for the content of vitamins, minerals, high-grade proteins essential for human health. Buckwheat contains a complex of minerals necessary for human health – calcium, iron, zinc, copper, manganese, phosphorus, and a complex of organic acids promoting digestion. Compared to other cereals buckwheat contains more vitamins PP, B1, B2, E and rutin. 100g of buckwheat groats contain 335 calories. Buckwheat groatsare important dietary product indispensable for the proper nutrition of children and adults, it is recommended in atherosclerosis, hypertension, cardiovascular disease, obesity, diabetes, diseases of the digestive tract. Useful properties of buckwheat: buckwheat groats’ protein contains eighteen amino acids and is similar in composition to a balanced protein of eggs and milk powder. Proteins belonging to the buckwheat help to cleanse the body of radioactive substances and normalize growth of the child's body. Unground buckwheat– whole and slightly split buckwheat grainsproduced from not steamed buckwheat by removing the nucleus from the amniotic membrane. We produce unground buckwheat of the first, second and third grades. Unground fast boiling buckwheat– whole and slightly split buckwheat grains, produced from steamed grains by removing the nucleus from the amniotic membrane. We produce unground fast boiling buckwheat of the first, second and third grades. Crushed buckwheat– crushed into pieces buckwheat grains, produced from not steamed grains by removing the nucleus from the amniotic membrane. Crushed buckwheat is not divided by grades. Crushed fast boiling buckwheat- crushed into pieces buckwheat grains, produced from steamed grains by removing the nucleus from the amniotic membrane. Crushed fast boiling buckwheat is not divided by grades. 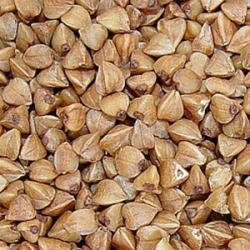 Unground fast boilingbuckwheat of first grade is packet into polymer 1 kg bags and into 25 kg and 50 kg bags. Agricultural Holding “August” – the group of companies that works professionally in the agricultural market of Ukraine– sells buckwheat in bags of 50 kg.